Since its debut on iOS platforms in 2009, Rovio’s Angry Birds has spun off into its own mega-franchise that includes games, toys, cartoon shows, theme parks, integrations into religious analogies (seriously, look it up), and now – of course – a feature-length animated movie, hoping to capitalise on the brand even further in the same way that The LEGO Movie did with its own brand a couple of years ago. What they don’t seem to realise is that while The LEGO Movie was undoubtedly a feature-length toy commercial, it was made with such warmth, such passion and such admiration for the product that, in the end, nobody cared because it was a funny, entertaining and genuinely good movie in its own right. The Angry Birds Movie is the anti-LEGO Movie, a film made solely to sell more products, and no other identifiable agenda that makes it worthwhile. This is the kind of animated film not seen since the likes of Shark Tale, drenched in cynicism and pandering heavily to the young demographic with pop culture references, toilet humour, and extremely dated language that will feel old the moment it’s uttered on-screen. Making matters worse is how it doesn’t even attempt to be fun for anyone over the age of six, and comes across to anyone over that age as being the cinematic equivalent of a particularly bratty kid with ADHD on a sugar rush, with it being exactly as charmless and frustrating as you would expect. Its plot attempts, very pointlessly, to explain why the birds are so angry to begin with; one day, on a peaceful island of flightless birds (why they can’t fly is never explained; maybe they just removed those lessons from the curriculum), a boat filled with green pigs arrives and wins everyone’s respect, but despite the scepticism of one such bird named Red (voiced by Jason Sudeikis) they soon make off with all of the island’s eggs and leave them in the lurch. Understandably pissed, the birds vow vengeance by using catapults to invade the pigs’ kingdom, and anyone who has ever downloaded the game onto their phone can guess where it all goes from there. We say it’s very pointless, because a) the game summarised this backstory in mere seconds using a couple of illustrations instead of over half of a 97-minute movie, and b) the fact that we already know how this story plays out makes it so unenjoyably predictable, leaving you stuck in your seat waiting for the familiar plot beats to show up without any investment in the story or characters whatsoever. Speaking of whom, many of them are just not that interesting or even that likable. Red, in particular, may have severe anger issues but his snarky attitude to everything and everyone as well as some aggressive displayed early on do not make him someone worth rooting for, especially when they’re meant to be the main protagonist; and though Sudeikis is at least trying, his voice isn’t quite the right fit for his character. His co-stars fare no better, with a hyperactive yellow bird named Chuck (Josh Gad, who is basically doing Olaf from Frozen as if he were on speed the whole time) being particularly grinding after a short while, Peter Dinklage being given little to do other than embarrass himself in the recording booth as the reclusive Mighty Eagle (between this, Pixels and the upcoming The Boss opposite Melissa McCarthy, is everyone in Hollywood just eager to humiliate him on the big screen for some reason? Maybe they just hate the Lannisters…), and – in the most bizarre piece of casting in the film – Academy Award-winning actor Sean Penn showing up to do nothing but grunt as the silent, oversized bird Terence, who honestly gets more laughs just through his silent expressions than the majority of the actual jokes in the movie. Writer Jon Vitti, who has written several early episodes of The Simpsons but also the first two Alvin and the Chipmunks films (yes, even The Squeakquel – it hurts us to even type that word), injects a lot of the same hackneyed and just plain hacky humour that plagued those latter films, cramming in everything from dreadful puns – one of the pigs’ names is Jon Hamm, they read Fifty Shades of Green, there is a sign for a Pork Chop Karate Studio, and we haven’t even skimmed the surface – to inappropriate toilet humour – a urination gag runs for about thirty straight seconds, more than outstaying its welcome – none of which succeeds in bringing up any kind of laughter or enjoyment from anyone who isn’t a young child. 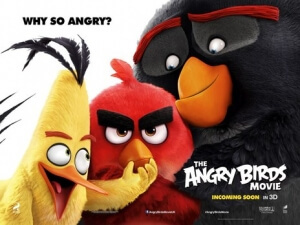 Although the colourful animation is fine, it can’t disguise the overall cynical reason for the film’s whole reason for being; to sell more products bearing the Angry Birds name, and that’s it. It’s sad, because films like The LEGO Movie have proven that it’s possible to make a good movie out of something that came from a commercial mind-set, but it needs to remember to be a functioning movie with a story and characters that audiences want to follow or be invested in, which The Angry Birds Movie so pitifully fails to do. If you want a better Angry Birds experience, just load up the app on your phone and play away. The Angry Birds Movie is a cynical big-screen attempt to cash in on its own popular franchise, neglecting the charm and warm-hearted humour that made similar films like The LEGO Movie such a success in favour of pandering to young audiences who aren’t smart enough to look past the dated pop culture references, inappropriate toilet gags and uninteresting, even unlikeable, main characters. Playing the game on your phone is a much more fun experience.